This book focuses on the role of social media as the next major game-changer. Social media has emerged as the defining trend in the last decade and continues to restructure communication and interactions between individuals, communities, governments and businesses. Researchers and marketers are still struggling with the profound impact of rapidly evolving social media on viral user-generated content, its ability to shape consumer perceptions, and the constantly changing landscape for developing business cases to proactively engage with stakeholders. The growing opportunities to “hear” about customer priorities and concerns on company managed channels as well as third-party review sites, including social media pages, across the digital space are accompanied by the challenges of responding to these conversations in real-time, which calls for a massive shift in the way marketing functions engage in dialogue with customers. As leading users of social media in emerging markets, Indians are increasingly logging into their Facebook and Twitter accounts, with the country recording the highest growth in social networking. 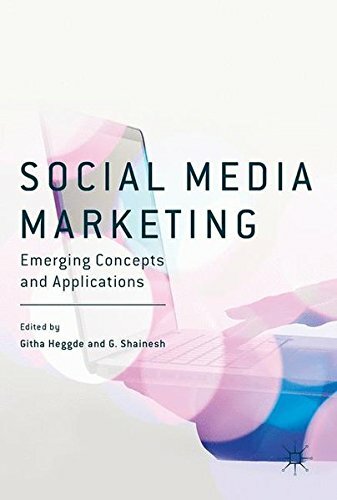 This book begins by discussing the impact of social media on marketing, from brand building, communications, and advertising to customization and customer engagement. The book approaches the subject matter systematically, identifying broad trends, concepts and frameworks in the first few chapters. It then goes on to address the varied application of social media in marketing for different sectors. Primarily focusing on understanding digital consumers, the book integrates social media with marketing and the outcome. It also presents new, selected cases of successful digital companies in emerging markets never before considered. Researchers and managers alike will find this book to be a handy reference guide to social media in emerging markets.